Shhh! Don’t tell a soul, but one of the most spectacular and accessible of all the waterfalls in WNC may not be on anyone’s Top 10 list. Yet Pearson’s Falls, a 268-acre wildflower wonderland near Saluda, sparkles with some 200 native Appalachian species of trees and shrubs, flowers and vines, ferns and mosses, algae and lichens—ranging in size from a quarter-inch high to 100 feet or more, with quite a few of them rare or imperiled. 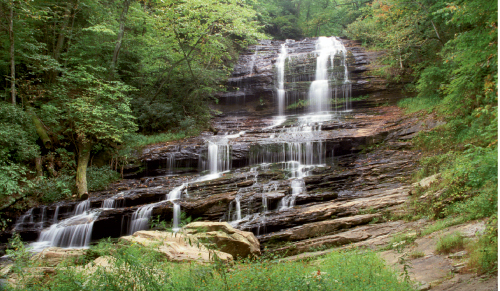 Enjoy them all along a meandering quarter-mile trail that ends at a broad 90-foot waterfall. Two other falls grace the property, one of them a perpetually dripping gash in the earth with its own mossy microclimate. The sanctuary is a place to slow down and relax by looking and listening. A visit might include sightings of birds like the ruby-throated hummingbird, the blue heron, Louisiana waterthrush, black-throated green warbler, or the scarlet tanager. The early spring months of April and May are especially lush. Turn a trip to Pearson’s Falls into a mini vacation with a night in the quaint enclave of Saluda, a historic railroad town located three miles north of the falls.